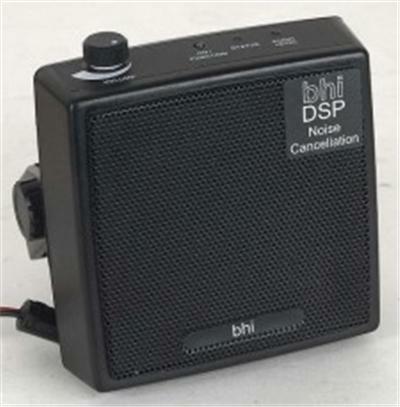 The DSPKR DSP noise cancelling speaker incorporates unique DSP technology to remove unwanted background noise and interference from speech, and has up to 7 DSP filter levels allowing the user adjust the filter for their level of noise and interference. The speaker simply connects into the extension speaker socket or headphone socket of your audio equipment and requires 10 - 16 V DC (1A min). The DSPKR comprises a wide frequency range 4” speaker and an audio amplifier capable of producing up to 10-Watts audio power, with built in bhi DSP noise cancelling technology. The unit also has a sleep mode, and requires an audio input signal of between 80 and 500mV level and a DC supply of between 10 and 16 Volts (2A). The unit is supplied with an attached black 2 metre audio cable with a moulded 3.5mm jack plug for the audio input, and a red/black 2.1mm fused DC power lead with bare ends. A 3.5mm mono auxiliary output socket is provided to allow the speaker to be used with headphones or to drive another loudspeaker. A 12V DC plug-in mains power supply PSU12-1A is available as an optional extra. Want to connect two radios to your bhi unit or speaker? The bhi two-way Mini Switch is an easy to use low cost solution that allows you to do this. It comes supplied with two ALD-001 3.5mm audio plug leads to connect to your radios, and instructions for use.